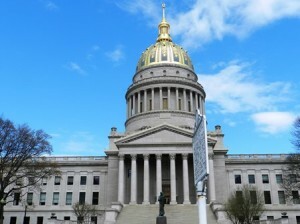 Linda Burton posting from Charleston, West Virginia – Imagine building a house with 333 rooms. 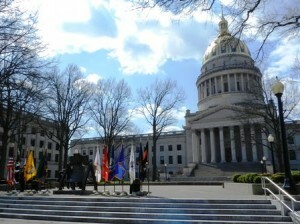 When you stand in front of the West Virginia State Capitol, you have to think about that. How did Cass Gilbert do it, back in the early 30’s? More’s the question, how did he manage to finish the monumental project on time, and under budget? It seems he used a simple principle – he broke a huge task into smaller parts; as easy as one, two, three. 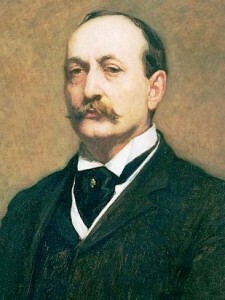 Cass Gilbert (1859-1934) had a well-established reputation when he was selected to design a capitol for West Virginia. Born in Ohio and educated at MIT, he lived in Minneapolis for many years; he designed a number of buildings there and was commissioned to design the Minnesota State Capitol in 1895. That wow-factored his name so much he moved his operations to New York, where he became a celebrity architect. He designed the Woolworth Building there; it was the world’s tallest building when it was built in 1913; his technique for cladding a steel frame became the model for decades. He designed campus buildings in Texas and train stations in Connecticut and the US Supreme Court Building in Washington, DC. West Virginia was in crisis need for a new capitol when the Capitol Building Commission selected Cass Gilbert on July 23, 1921. The West Virginia capitol had mysteriously caught fire and burned beyond use on January 3 of that year; government operations were moved to a temporary building dubbed “the pasteboard capitol.” Cass Gilbert and the Commission began to search for a suitable site for the permanent construction. By the end of December the location was settled and Gilbert began the master plan. I’ve made it sound more simple than it was, of course, there was much debate and disagreement before that point was finally reached. But it was a good piece of property, with room for expansion. And now we come to the “One Two Three” aspects of the project. The three units of the capitol complex were let as separate contracts; each one financed, built and inspected before beginning the next phase. And remarkably, each unit was built for less than the legislative appropriation. The West Wing was erected between January 1924 and March 1925 for a cost of $1,218,171; the East Wing, erected between July 1926 and December 1927, cost $1,361,425; and the main unit built between March 1930 and February 1932 cost $4,482,623. Adding up all charges for materials, labor and fees, land acquisition, and beautification, the total investment was $9,491,180. The result – 333 rooms, 535,000 square feet of floor space, 18 acres of grounds overlooking the Kanawha River; a peaceful setting for a functional building with a glamorous look. The glamour comes from the special touches like the 293-foot dome; the ribs and intricate patterns of gold leaf are stunning against a background of brilliant blue; a golden eagle sits atop the tower. 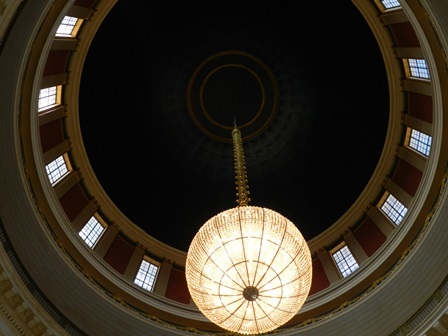 And inside, where a chandelier hangs from the peak of that dome; the brass and bronze chain suspends it 54 feet; the fixture is eight feet in diameter and is made of 10,080 pieces of Czechoslovakian crystal; it weighs 4,000 pounds and is illuminated by 96 light bulbs. There are chandeliers in each of the Chambers too; identically designed, made of crystals and glass beading. Desks in the Senate and House are hand-carved black walnut; the Great Seal of the state, carved in cherry, hangs above the dais in each chamber. The exterior is Indiana limestone; more than 700 train carloads of it were used, and 4,460 tons of steel; a special spur rail line was laid on the grounds to bring materials in. I was intrigued by some of the construction details; for example, earth removed for the basement of the west wing was used to fill holes left by the removal of structures on the site. Every tree that was removed was boxed and marked; every bush and shrub was saved to be reused on the finished grounds. 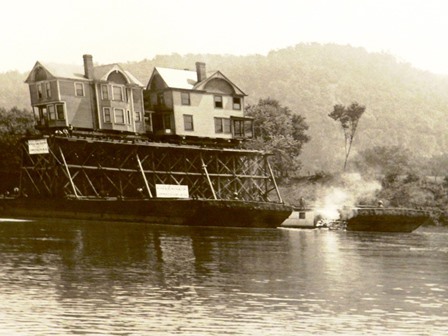 The most amazing construction pictures I saw were those of houses that had to be moved; they were placed on barges and floated across the river intact; then repositioned riverside with a magnificent river, and capitol, view. Cass Gilbert personally designed the furnishings and décor of the Supreme Court chamber; carvings depicting the “Scale and Balance” and the “Book of Law” adorn the sides of the skylight. Along the top of the walls are the quotes “The foundation of republican government is the equal right of every citizen in his person and property and in their management,” Thomas Jefferson; and “Firmness in the right as God gives us to see the right,” Lincoln. Columns of white Vermont marble with bases of black Belgian marble surround the room; dark green antique marble makes up the steps leading to the dais. It is said that this was the model Cass Gilbert used several years later when he designed the US Supreme Court chambers, his last and final achievement. That’s about all I have to say, except, it’s worth a trip. When I entered the grounds today, a ceremony was underway honoring Viet Nam Veterans; flag were fluttering on either side of the Liberty Bell; booths offering veteran’s services lined the walkway; a band played patriotic songs. 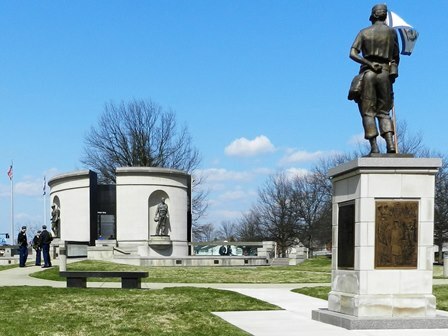 I met some cadets from the local ROTC, they were to appear at 1 PM, they said, as they headed towards the West Virginia Veterans Memorial near the parking lot. There’s a bust of Booker T Washington outside; he spent his early life near Charleston and went on, you know, to found Tuskegee Institute in Alabama in 1881. There’s a Coal Miner Statue too; a tribute to West Virginia’s coal heritage. Inside I spotted a statue of Robert Byrd, the US Senator from West Virginia who gave more than 50 years of public service. And tucked away at the edge of the rotunda was a bust of Anna Jarvis. She’s the West Virginia lady who is credited with making Mother’s Day a nationally recognized holiday. 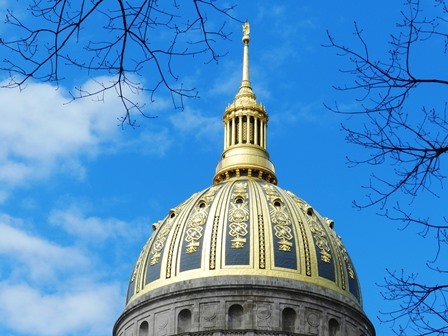 The West Virginia State Capitol is a beautiful thing to see; there’s a kind of sweetness there; but even more impressive, I believe, is the story of its construction. It’s an interesting tale of what can happen with good planning, careful attention to detail, and wise use of resources. It’s really as simple as one, two, three. Note: The West Virginia State Capitol was formally dedicated on the state’s 69th birthday, June 20, 1932. It is the sixth building to serve the state as capitol. 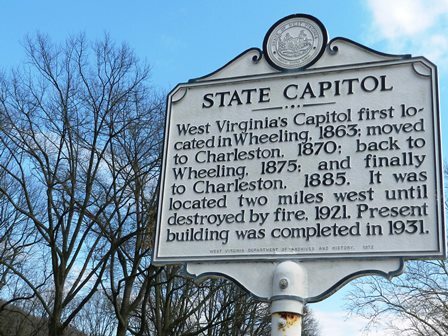 Wheeling served as West Virginia’s capital twice; first between 1863-1870 and then between 1875-1885. Charleston has had four capitol buildings; one between 1870-1875; one between 1885-1921 (that’s the one that had burned when Cass Gilbert was hired); and the temporary “pasteboard capitol” that served during the time the current capitol was under construction.